Coffee grinder is essential for those who often drink coffee in their daily life. Not only you can make your own favorite blend, but fresh coffee does taste more delicious. Among so many grinders from various brands available, Cuisinart DBM-8 name is very popular. This grinder comes in such an affordable price and offer a wide range of grind sizes for you to choose. If you want to purchase a good grinder but don’t want to dig too deep into your pocket, go check our article below. Cuisinart DBM-8 is one of the most popular coffee grinder available in the market. Even though Cuisinart is not an exclusive brand for coffee related machines, this product is many people favorite because not only it is quite affordable it also come with great capabilities. We know that for a coffee enthusiast investing on a good grinder is a must after you get your dream brewer. If you own a grinder, you can make your own blend from beans of your choice and make your coffee freshly every time. Not all coffee brews are made from the same ground. We know that if you enjoy coffee like espresso, you have to use super fine ground coffee to extract the best taste off the ground. At the other hand, if you enjoy French press or Cold brew coffee, you should use coarse ground. In each method, the perfect ground is needed to get the best result possible, which is why choosing the right grinder is important to facilitate you with the right ground for your every coffee. 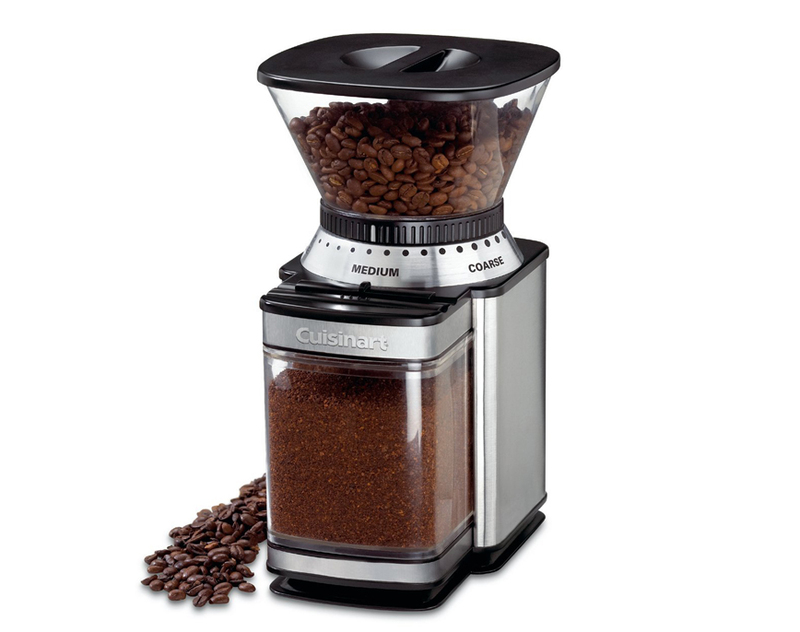 From the outside, Cuisinart DBM-8 looks just like any coffee grinders. There are not much detail on the item as well as complicated controls. The body is a combination of stainless steel and plastic material in black color. The bean hopper as well as the ground compartment is made from clear plastics, so you can easily see the inside. Measuring at 6” in length, 7.13” in width, and 10.75” in height, the unit will not consume too much space in your kitchen top. For similar item, check our article on Gaggia MDF vs Baratza Virtuoso here. Using Cuisinart DBM-8 is very simple. First, fill the bean hopper and close the lid securely. Second, plug the cord and set the grind selector depend on how you coarse or fine you want your coffee to be. Third, positioned slide dial into how many cups you want to make. Fourth, press and release the power button to start grinding. The machine will stop automatically when the process is done. Cuisinart DBM-8 comes with generous grind settings in 18 sizes. As it have been mentioned above, what kind of brew you love decides what kind of ground you need. With these generous options you can pick, you can grind your beans as coarse to make French press so the coffee won’t pass through the filter and create a sediment in brew or as fine as you need to make espresso. Unlike many grinders, where you have to decide how many times needed to grind an amount of beans. Cuisinart DBM-8 lets you set the machine to grind between 4 to 18 cups, so you don’t have to guess the time and quantity needed to brew how many cups of coffee. You can easily set the machine to work as long to produce approximately 18 cups. The time needed to ground 4 cups is 20 seconds, 12 cups is 40 seconds, and 18 cups is 55 seconds. The setting may not perfect since people have their own preference and can choose to use more or less coffee ground, but aside from that the machine gives you a pretty nice approximate amount you need for a number of cups. Cuisinart DBM-8 have a coffee bean hopper with a maximum capacity until 8 oz. which is large enough for a family. The grind chamber is also able to contain coffee ground for up to 32 cups serving of coffee. Combine with the grinder capability in producing coffee ground for up to 18 cups of coffee, the unit is perfect for regular coffee drinker with a large family or often serve coffee to their guests. Another important point when choosing an appliance is the safety of the product. Cuisinart DBM-8 is very safe to use. The machine will not run unless the hopper and chamber is placed in their correct position, which means you can’t use the unit if they are not properly set to prevent pieces from flying off and hurt you. With its quantity settings we talked earlier, the machine will turn off automatically when its duty is over to prevent it from overheating or melt. Similar like your other kitchen appliance, you should clean the unit regularly. The thing about Cuisinart DBM-8 is you can clean it pretty easy by separating the grinder from the hopper, grinding burr and grinding chamber. All of those removable parts are dishwasher safe if put in top rack. After all of them are taken apart, you can use included brush to clean the left behind grounds and do not immerse the grinder base in water or other liquid. All in all, Cuisinart DBM-8 is a great machine for you who want to own a coffee grinder but don’t have much to spend. The grinder is not a burr grinder but a disc burr, so for you who often enjoy espresso or other coffee which required finer ground, this machine is probably not for you. Besides grinding coffee, you may use DBM-8 to ground grain or as grain mill, but make sure to clean it properly before and after each use, to avoid contaminating your coffee ground taste. Check the best price of Cuisinart DBM-8 here!